Mr OneTeas started out as a graffiti artist in 2005. He developed his self-taught style from his travels, encounters and exchanges always leaving his mark on the streets of the major international cities he visited. He puts his hand to everything: mixing aerosols, acrylics, stencils, photo, collage and resin on a wide variety of supports: canvas, bodies, cars, façades and walls. 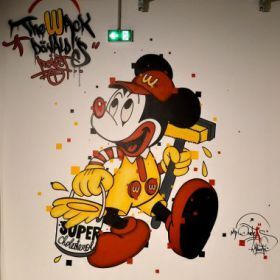 In 2011, he started the " The Wack Donalds Project " which can be seen at Molitor amongst other locations. After a period out of circulation he returned in march 2014, in the streets of Prague, New York, Rome, Paris, Brussels, Porto... His work breathes new life into consumer products from the past whilst using them to illustrate the evils of our society. He draws his inspiration from media, political and cultural sources. He modifies images and news information to offer us with a critical vision of society, with a fair touch of his personal humour and originality.